Our Boom Nesting Guards prevent metal on metal contact where the boom seats in the nesting cradle in its transport position. Without the guards the cradle and boom become burred and bind when folding and unfolding. 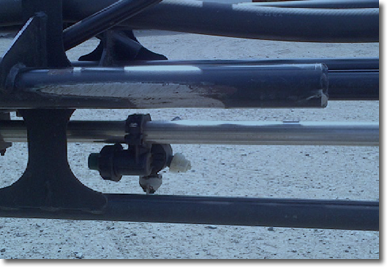 Boom Guards reduce binding when opening by allowing the poly to slide and roll around the factory boom tube captured by our custom aluminum retainers with stainless hardware. 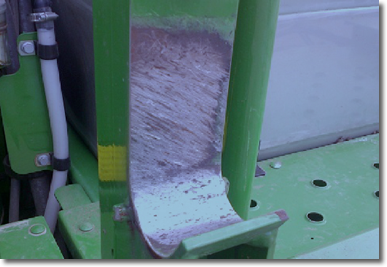 Boom Guards provides a snug fit to the cradle when travelling to and from the field without the metal to metal contact. 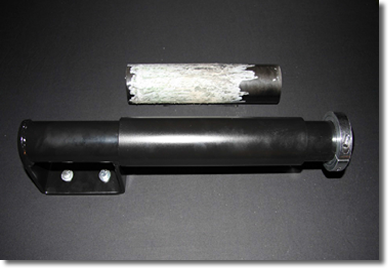 The picture above illustrates a new boom guard and a retaining collar installed. The guard above was removed after 100hrs of use to illustrate the amount of wear these surfaces endure. Our kits include 2 sets of Poly (4 pieces) and 2 retainers. Installation time is 20-30 min.